In December 1952, a toxic haze of smog and fumes descended on London, so deadly it was linked to more than 1,000 deaths in four days. At the same time, equally horrifying in its own way, a nondescript serial murderer was in the midst of a years-long killing spree. Ultimately, at least four women would die by his hand, possibly an infant as well. 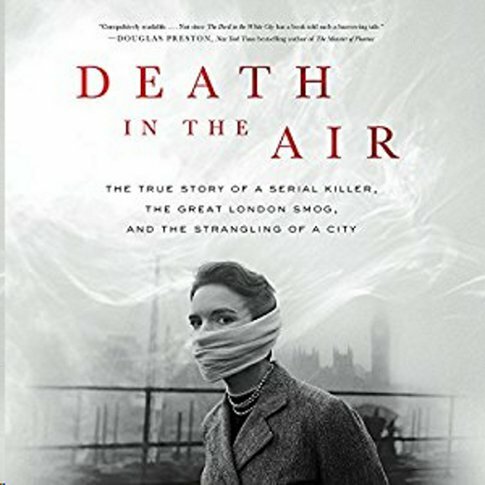 The account of these twin occurrences plaguing England’s capital is the subject of Death in the Air, a new “true crime” account by veteran journalist Kate Winkler Dawson. Compounding the dual tragedy was the fact that Great Britain was still emerging from the ravages of the Second World War. Living conditions were dire. Food was still rationed. And winters were very, very cold. Meanwhile, in his Notting Hill flat, an unremarkable city transportation clerk named Reginald Christie quietly continued a series of grisly murders begun nearly a decade before. He preyed on vulnerable women, suffocating them (as the air itself asphyxiated thousands) and eluding detection by the authorities for an absurdly long time. At places in the book, the narrative falters. Extended accounts of meetings in Parliament (to debate smog bill legislation) sometimes read like the minutes of a local city council meeting. And there’s a thin strand connecting the citywide deaths by smog with those of a single murderer who’d been quietly perfecting his craft for years before the extreme weather event. Millions of Londoners experienced this all-encompassing torment during the last days of 1952. Many never survived the ordeal. Lee Polevoi, Highbrow Magazine’s chief book critic, has just completed a new novel, The Confessions of Gabriel Ash.